Welcome to Shred Wise Inc., the best value for commercial and residential paper shredding services in Tustin. We have been serving the Tustin community since 2006, helping our customers reduce the chances of identity theft and data breaches by helping them to keep their sensitive information safe and secure. Because privacy and confidentiality are issues that everyone faces, individuals and businesses alike stand to benefit from our professional paper shredding services. Over the years, we’ve worked with individuals, families, estate managers, doctors, dentists, veterinarians, hospitals, lawyers, CPAs, real estate companies, financial institutions, schools, non-profits, government agencies, and more, and have learned how to meet their varied document destruction needs. All of these services are performed by our own trusted staff, who have been carefully vetted and thoroughly trained. They can be trusted to consistently follow the leading paper shredding procedures for optimal security and be knowledgeable of all local and Federal privacy laws, particularly as they relate to proper document storage and disposal. Additionally, we are NAID-compliant and stay apprised of regulatory changes and do our best to share this information with our commercial clients in Tustin. By working with Shred Wise, you can trust that you are working with experienced shredding professionals who are dedicated to service. We always provide service with a smile and go above and beyond to keep our clients happy. To ensure that our clients in Tustin get the best value possible, we also offer customizable shredding programs at highly competitive rates with flexible service. If you would like to learn more about Shred Wise or wish to schedule mobile shredding services in Tustin, give us a call. We provide quotes over the phone and offer free on-site consultations. We provide mobile shredding services in Tustin, Monday through Friday. As a locally based shredding company that concentrates over 90% of its service routes in Orange County, we can often accommodate last-minute mobile shredding requests for same-day or next-day service in Tustin. Additionally, we are open for drop-off shredding services seven days a week (Monday through Saturday, from 7:00 am to 5:30 pm, and Sundays, from 8:00 am to 12 noon). This is particularly effective for very small shredding jobs of just a few boxes. We accept cash, check, and credit cards (Visa, MasterCard, and Discover). 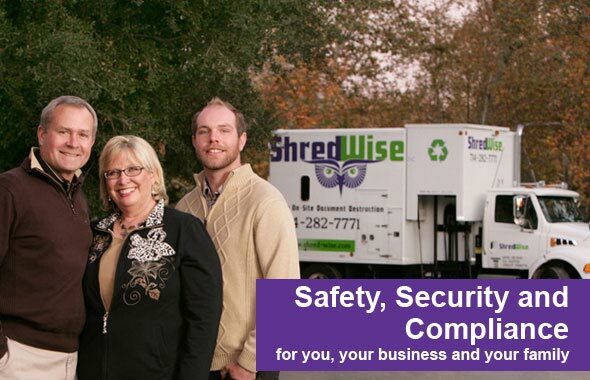 Shred Wise Inc is a family owned and operated mobile shredding company that is dedicated to offering secure, reliable, and convenient paper shredding solutions at highly cost-effective rates. The owners, Gary and Sherry Metcalfe, started this business after they themselves became the victims of identify theft three times. As a result, they founded Shred Wise Inc. in the hopes of helping others in their local community to better protect themselves against identify theft and information breaches. We are fully licensed and insured to provide shredding services in Tustin and throughout Orange County. We also abide by NAID’s Code of Ethics and follow their recommended best practices for information destruction. As such, our paper shredding services comply with HIPAA, GLBA, FACTA, and other current privacy laws and regulations. With Shred Wise, you can bring your boxes of paper with this type of sensitive information to our facility in Orange, or arrange for us to come to you. With our high-capacity mobile shred truck, we can shred any volume of paper right in front of your Tustin home or business. We finish most jobs in a matter of minutes. When we are done, we issue a Certificate of Destruction and take all of the paper we shred to a recycling facility to be made into new paper products. 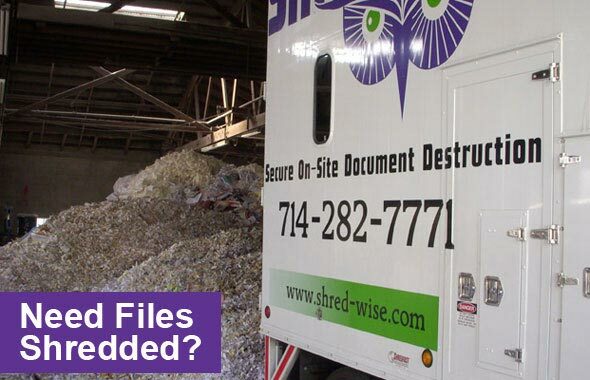 Shred Wise has been destroying the sensitive documents of Tustin businesses since 2006, and we’ve designed our mobile shredding services to save them as much time, money, and hassle as possible. With every mobile paper shredding service call in Tustin, one of our professionals will arrive within the timeframe promised, pick up your shred containers and/or transfer your papers into secure shred bins, take them outside to the shred truck, and use an automated feature on our truck to lift and empty the bins into the shredder. Tustin clients can witness the destruction process while standing curbside or by viewing our onboard shred camera. The papers are shred on site within a matter of minutes and then mixed with all the other shredded paper inside the truck. When we are done, we provide you with a Certificate of Destruction, and take all of the shredded paper to a nearby facility to be recycled into new paper products. Not only does this service save time, but it also helps businesses comply with privacy law requirements for document destruction. It also contributes to being more green as we recycle 100% of the paper we shred. Call today to learn more. When we’ve done outreach at community events, conferences, or businesses, many of those attendees will tell us that they didn’t realize how vulnerable they were to identify theft and how easy and affordable it would be to arrange on-site shredding. While many residential clients prefer to take their boxes of paper directly to a shredding facility, it actually is often less expensive to schedule our mobile shred truck to come out and shred your documents for you. So, call today and obtain a free quote for on-site/mobile shredding services in Tustin. If your location makes it hard for our mobile shred truck to come on site and you would prefer that all of the shredding is done elsewhere, then we recommend our off-site shredding services. Tustin businesses and residents can benefit from this convenient and affordable service. With off-site shredding, we send a panel truck to your site and have one of our professionals load your files, boxes, or other paper containers into our truck. All paper is kept secure in our truck and transported back to our facility in Orange. Once we get back to our facility, we immediately shred your documents in the same mobile shred trucks used for on-site shredding. And, just like on-site shredding, you will receive a Certificate of Destruction for your records, and be guaranteed that 100% of your paper will be recycled. Call today to obtain a personalized quote for our off-site shredding service in Tustin. 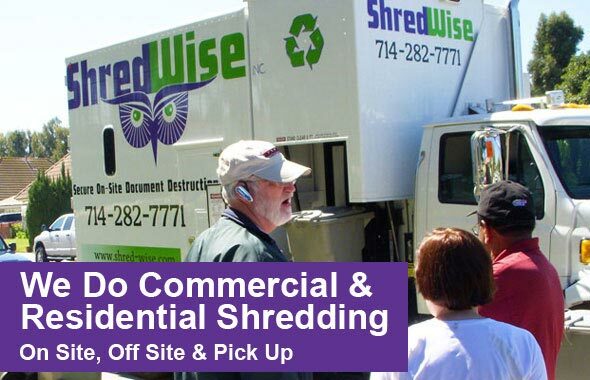 Shred Wise Inc. consists of information destruction experts who are happy to help you create a document shredding plan for your needs and budget in Tustin. We’ll help you determine whether you would benefit most from outsourced or in-house shredding, off-site or on-site shredding, or as-needed or ongoing shredding services. We can also help businesses in Tustin that need to ensure that their practices are compliant with today’s local and Federal privacy laws, as well as those who need to create a records retention schedule. Moreover, we keep our customizable services flexible, so we can easily adapt them as your shredding needs change over time. If you would like to learn more about our Tustin shredding services, call (714) 282-7771 today.